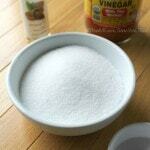 In a medium size bowl mix together sea salt, almond oil and apple cider vinegar until well mixed. 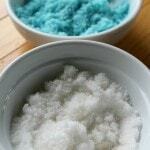 Add 15 drops of Tea Tree Oil and 20 drops of Lavender Essential Oils. 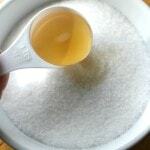 Take half your mixture and put it into another bowl. 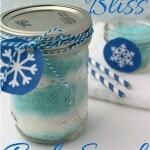 In Mason jar, alternate blue and white layers of scrub to create a snowy effect. 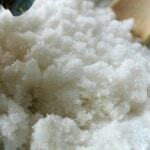 Press scrub mixture down with a spoon to compact between layers. 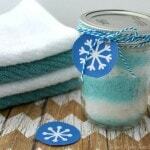 Attach a cute snowflake label to your jar and you have a great DIY gift anyone will be sure to love!